News and information on soccer teams, clubs and leagues. PORTLAND, Ore. (August 11, 2010) — The Portland Timbers of Major League Soccer (MLS) today introduced John Spencer as their first head coach in club history. After five seasons as an assistant coach with the Houston Dynamo of MLS, Spencer will lead the Timbers in their inaugural MLS season in 2011. 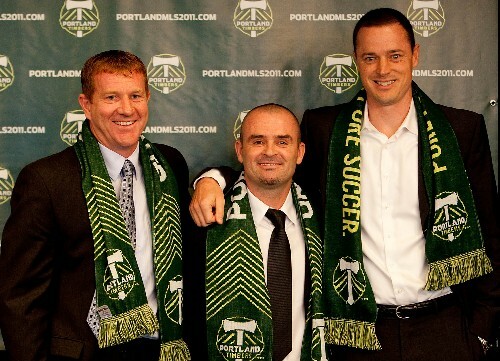 Timbers technical director Gavin Wilkinson made the announcement. Spencer, 39, was introduced formally at a news conference Wednesday morning in Portland. Following an 18-year playing career, Spencer joined Houston in 2006 and served as an assistant under head coach Dominic Kinnear for nearly five seasons. He helped lead the Dynamo to back-to-back MLS Cup championships in 2006 and 2007 and four consecutive playoff appearances, including a run to the Western Conference finals in 2009. From 2006-08, Spencer also coached the Dynamo Reserves, guiding Houston’s reserve squad to the 2008 MLS Reserve Division championship. Prior to beginning his MLS coaching career, Spencer played professional soccer for such noted English clubs as Chelsea, Everton and Queens Park Rangers, and Scotland’s Rangers. In MLS, Spencer starred for the Colorado Rapids from 2001-04, becoming the only player to be the team’s MVP and scoring leader in the same season more than once. Spencer, a native of Glasgow, Scotland, began his professional playing career in 1987 with Rangers. As a striker, he played for several top-flight clubs over 14 seasons in Scotland and England, most notably amassing 43 goals with English-power Chelsea (1992-96). In 2001, Spencer joined MLS with the Colorado Rapids, where he played until he finished his career in 2004. During his time with Colorado, he played in 88 games, and his 37 goals ranks among franchise career leaders. Spencer twice led the Rapids in goals scored, set the club’s single-season mark for goals (14) and career mark for assists (17), was a two-time MLS Best XI selection (2001, 2003) and was a finalist for the league’s MVP award in 2003. During the 2003 season, Spencer scored in six straight games, one away from tying an MLS record. The two-time MLS All-Star (2001, 2003) captained the Rapids to three straight playoff appearances from 2002-04. Spencer was inducted to the Rapids Gallery of Honor on Aug. 30, 2009. During his playing career, Spencer also earned 14 caps with the Scotland National Team from 1994-97. He earned his first cap in front of a home crowd against Russia in 1994, and his international career was also highlighted by the 1996 European Championship in England. Spencer also played for Lai Sun of Hong Kong while on loan in the late 1980s, scoring 20 goals in 24 games. John and his wife, Amanda, have three children, Brad, Chantelle and Dylan. John and his family are in the process of relocating to Portland. Headquartered in New York City, Major League Soccer is the top-flight professional soccer league in the United States and Canada. MLS features many stars from the U.S., Canada, and around the world. MLS kicked off its 15th season on March 25, 2010. MLS features 16 clubs each playing 30 regular season matches in 2010. Those teams include Chicago Fire; Colorado Rapids; Chivas USA; Columbus Crew; D.C. United; FC Dallas; Houston Dynamo; Kansas City Wizards; Los Angeles Galaxy; New York Red Bulls; New England Revolution; 2009 MLS Cup Champion Real Salt Lake; San Jose Earthquakes; Seattle Sounders FC; Toronto FC; and, in their inaugural season, Philadelphia Union. Expansion teams in Vancouver and Portland will debut in 2011 and in Montreal in 2012. For more information about MLS, log on to the League’s official website at www.MLSsoccer.com. Club 9 increases the value of its offer to invest in the historic English Owls football club by nearly 50%.